Maddy Southward skies high over the balance beam performing a straddle jump. Southward placed third in the event. Devan Thomas completes her routine with a flyaway one-half dismount off of the high bar. Lizzy Valentine dares to flip up and over the vault backward (blind landing) while performing a Yurchenko entry one-half twist off. Sydney Shadburn executes a cartwheel on top of the 4-inch wide 4-foot tall balance beam. 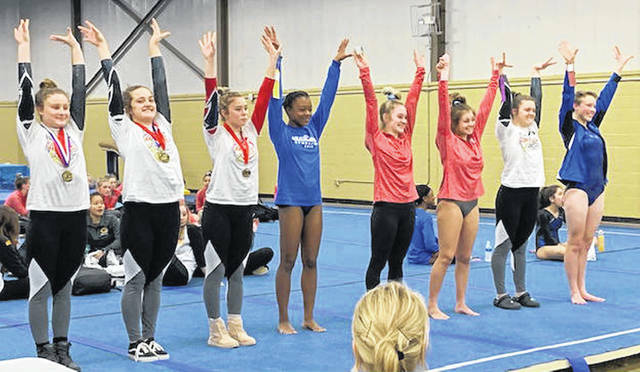 Local Gymnasts place in meet held at Miamisburg Thursday, Feb. 7, 2019. Devan Thomas stands in first place (at left) in the All-Around competition followed by teammate Maddy Southward, second and in third teammate (from Greeneview), Lizzy Valentine. In seventh place is Kandice Mathews of Miami Trace. Recording their highest score of the season, the Miami Trace gymnastics team won their quad competition Thursday, Feb. 7 held at Miamisburg High School. Miami Trace had a team score of 121.3. Kings was second with a 113.95 followed by Miamisburg, 98.45 and Centerville, 95.75. Miami Trace juniors Devan Thomas and Maddy Southward took first and second place, respectfully, in the all-around competition. Thomas had a 32.25 scored and Southward tallied a 30.9. Greeneview gymnast Lizzy Valentine stood in third place (30.65) and Miami Trace freshman Kandice Mathews placed seventh (27.75). Also highlighting the competition was Alyssa Butler who won the vault scoring an 8.25. There were 21 competitors on the event. Maddy Southward earned the championship title on floor exercise with an 8.7 awarded score from the judge. There were 20 competitors on floor exercise. Thomas led her team in scoring with the following placements: vault, 3rd, 7.9; uneven bars, 3rd, 7.5; balance beam, 2nd, 8.55 and floor exercise, 5th, 8.3. Valentine placed third in the all-around (30.65), fourth on uneven bars (7.5), eighth on balance beam, 6.9 and third on floor exercise, 8.6. Miami Trace improved two of their event scores, balance beam and floor exercise. The group worked hard to increase their personal best marks, achieving 11 new high scores, head coach Susan Holloway noted.